For a while now I have felt disconnected with my own body – the past 12 months haven’t been great from my own personal fitness perspective – health issues and horrid back pain that took ages to go away left me feeling physically and emotionally exhausted. My body wasn’t working how it normally did and that was hard to handle. I have always loved being active so when I couldn’t be, I started to lose faith in my own strength and ability. Not good for anyone let alone a personal trainer! Last week I was on holiday with my family and finally had some time to stop, relax and have some quiet time. I swam (…well paddled whilst holding onto a small child), read books (yes more than one! ), relaxed, beat my husband at pool (at least twice!) and started to think about why I had lost my trust in my own body and how I could get it back. Instead of thinking about all the ways that my body didn’t work in the same way it did in my 20’s, I thought about all the things I liked about it. - I have strong legs. They are not and have never been skinny and to be honest I don’t want them to be. They are strong. They have helped me run a marathon, row (and win) at Henley Women’s Regatta, climb the 3 Peaks, hike the Grand Canyon, complete a duathlon and triathlon and give endless piggy backs and shoulder rides to my girls. I am not saying all this to show off – but to show that we don’t all need to be a size 6 supermodel to feel good about ourselves. Skinny legs would not have helped me do all this, but strong legs did! - I have a scar on my left side from an operation when I was little. For whatever reason, I have always liked my scar – it’s part of me, it makes me different. Don’t hide away the things that make you different – embrace them, love them and show them off. - I have stretch marks from being pregnant with my two girls. No matter how much Bio Oil I slathered on they still appeared. Instead of hating them as I know some women do – I kinda like them. It reminds me that I managed to grow two tiny humans from scratch – my body did that and so I wear them with pride. - I have a strong core. Yes it helps that this is what I do for a living and I am constantly talking about core strength with my clients. But it took some time and a lot of effort to regain after having my children and whilst I can list all the benefits this can give you – the best thing about it is that I can be a better mum and all that entails with a strong core. So my message to you is to stop thinking about all the things you want to change about your body – it will make you sad and depressed – instead think about all the things you love, the things that make you unique and embrace them. 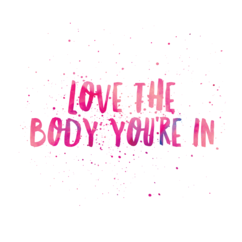 The more you love the body you’re in, the happier you will be.